It was just six months after a devastating tsunami ravaged the coast of Sri Lanka, destroying villages and killing thousands on the small island nation just off the coast of India. Marin Legatt (left) was in Sri Lanka during tsunami. In the aftermath of all that destruction - that’s when dancer Marin Legatt returned to the country, lugging a boombox, eager to check on old friends in a handful of villages on the southwest coast. The killer waves caught most of Southeast Asia off-guard in December 2004, the result of a 9.2 magnitude earthquake in the Indian Ocean. The storm killed more than 31,000 Sri Lankans and displaced another half-million people. The 33-year-old choreographer from Midvale, who three years ago launched her New York-based M.E.L.D. Danceworks company, had taught dance in these same villages before the tsunami. It was then that Legatt had fallen in love with Sri Lanka’s gorgeous coast, its delicious rice curries, fresh fish, prawns and lentil stew, and the friendly locals. All this charm in a country that had endured an ongoing civil conflict among different ethnicities for some 25 years. Her trips to Sri Lanka have inspired her to take action. Legatt wants to use dance to bring people together, and is currently working with Sri Lankan nonprofit agencies and writing proposals to fund more dance projects there. Her vision came to life last month through a grant from the U.S. Cultural Envoy Program, which sponsored her month-long trip to Mumbai, India, where she choreographed work with the local Terence Lewis Contemporary Dance Company. Sponsored by the U.S. Department of State, performing or visual artists who are envoys serve as educators, in a program aimed at strengthening ties between America and other countries. 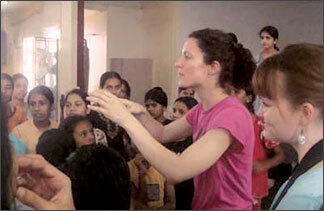 Her spare time goes to finding money to continue her mission to bring dance to troubled parts of the world.